The Mennonite Heritage Center houses a growing body of manuscript collections from local Mennonite and Brethren individuals and families. There are over 550 manuscript collections at the MHC, ranging in size from one folder to many boxes. Below is a list of significant collections. For research in museum and archival collections, please schedule an appointment with collections manager Joel Alderfer (phone: 215-256-3020, ext.111). 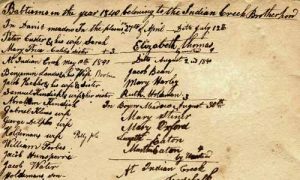 –genealogist, Latshaw-Bower-Borneman families, Boyertown area, Berks Co.
–genealogist, Butterweck-Bergey-Smith-Keeler-Nyce families, Montgomery Co.
–genealogist, Clemmer-Lapp families, Montgomery Co.
–genealogist, Halteman-Haldeman family, Montgomery Co. and Chester Co.
–genealogist, Hunsicker-Cassel-Kulp-Allebach families, Montgomery Co.
–genealogist, Landis-Detweiler-Gehman-Hockman families, Bucks Co.
–historian and genealogist, Skippack area families, Montgomery Co.
–genealogist, Shelly-Rosenberger-Ruth families, Bucks Co.
–tailor (account book, ca. 1800), Lower Saucon, Northampton Co.
–cattle dealer, Harleysville, Montgomery Co.
–musician, North Coventry, Chester Co.
–schoolteacher (public school, 1897-1943), Skippack, Montgomery Co.
–schoolteacher (public school, 1916-1949), Skippack, Salford and Limerick, Montgomery Co.
–photographer and entrepreneur, Plumsteadville, Bucks Co.
–80 letters, 1866-1878, Doylestown, Bucks Co.
–diary 1858-1863, Lower Salford, Montgomery Co.
–papers and photos from Delp-Ritter families, Harleysville, late 19th-early 20th cent. –110 letters, 1897-1903, Blooming Glen-Rockhill area, Bucks Co.
–diary 1875-1876, Souderton, Montgomery Co.
–diary 1913-1930, Spring City, Chester Co.
–papers from the Gottschall family of fraktur artists, Souderton, Montgomery Co.
–diaries 1870-1910, Hilltown, Bucks Co.
–diary (Jacob), photos, family papers, Telford, Montgomery Co., 20th cent. –diary 1870-1914, Lower Providence, Montgomery Co. and Milford, Bucks Co.
–diary 1812-1814, Towamencin, Montgomery Co.
–papers from the Mensch-Heckler-Seipt family of Skippack, Montgomery Co.
–family papers and business records, Doylestown, Bucks Co., late 19th-mid 20th cent. –diary 1909-1935, Hilltown, Bucks Co.
–papers and photos, Rockhill, Bucks Co.
–family papers and photos, Collegeville, Montgomery Co. The Mennonite Heritage Center houses over 100 photograph collections, including thematic collections assembled here at the MHC and collections acquired from local individuals and families. Below is a list of significant collections. –local school group photos, late 19th-mid 20th cent. –local tent revival meetings, mid 20th cent. –Allebach-Cassel families, Towamencin and Lower Salford, Montgomery Co.
–Delp-Moyer-Ritter-Keeler-Binder families, Harleysville, late 19th-early 20th cent. –Haldeman-Rosenberger families, Harleysville, Montgomery Co., early 20th cent. –collections of cousins Irene, Elizabeth and Abram Rittenhouse; late 19th-early 20th cent. –Longacre-Stauffer families, Chester Co. and Montgomery Co., mid 19th-mid 20th cent.